At Archer Electric, LLC, we help clients across Central and Southern Wisconsin from Green Bay to Milwaukee address their electrical safety, training, compliance, and engineering needs every day. 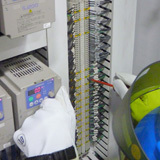 See how our master electrician and team are committed to providing excellent customer service and electrical solutions. "Archer Electric's service exceeded our expectations. The final product was done in such a way that even the novice worker could follow it. They did an outstanding job for us." "Russ knew exactly what had to be done. He was not trying to sell us some "magic dust" to make us compliant with Arc Flash Protection." - Mike Kelm, Senior Electrical Designer, Pemco Inc.
"I have seen first-hand the time and effort Archer Electric puts into their electrical audits and seminars. With the professionalism and pride that goes into their work, I would not hesitate to recommend their services to anyone!" "Russ is very thorough on his analysis and reporting. He makes sure he backs up his conclusions with data and gives more than one option to remedy my issues." "I believe Archer Electric's price was better than others because they knew what needed to be done. The other suppliers we had give us a quote were guessing on price due to lack of experience. Training brought great awareness to why the upgrade compliance is needed." - Dave Jetzer, Purchasing Agent, Pemco Inc.